In an iconic building designed by renowned American architect Robert A.M. Stern, The Residences at Mandarin Oriental, Atlanta, are situated in the heart of Buckhead, the city’s most prestigious neighborhood. High above Peachtree Road, on the top 27 floors of this 42-story building, residence owners have unparalleled views of the glittering Atlanta skyline. 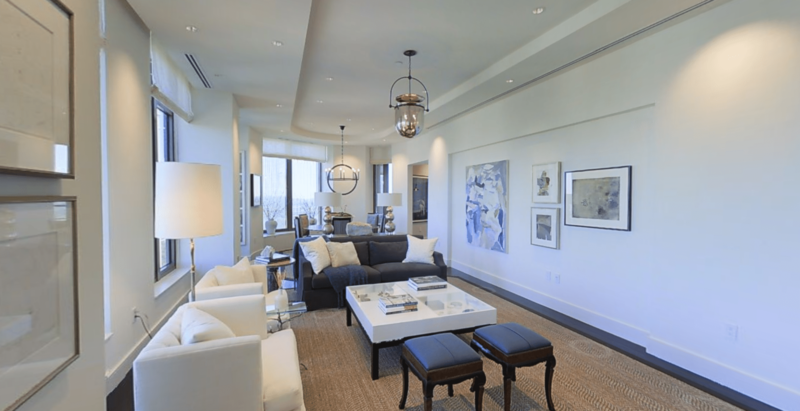 Starting at $2 million, the new units, designed by Buckhead’s top architectural firm, Harrison Design, feature contemporary, ultrahigh-end finishes and sleek, built-in fireplaces with marble surrounds. The Residences recently added this stunning new model home featuring interior design by Barbara Westbrook of Westbrook Interiors. The model, located on the 38th floor, features downtown and Buckhead skyline views, Acacia Provenza Palazzo Collection flooring, Wolf kitchen appliances and Caesarstone countertops. Barbara incorporated rich color and texture throughout the model, and one-of-a-kind art from local artists, including Whitney Ott.